14K Rose and White Gold Celtic knot wedding band. Celtic design is continuous around the entire band. Ring measures 9mm wide and 2mm thick. Also available in 18K Rose and White Gold, 14K Two-Tone Gold, 14K White Gold or any metal or color combinations by request, including platinum. This is a solid, substantial Celtic ring. Our 7mm version weighs approx. 11.0 grams and our 8.5mm weighs approx. 14.0 grams (weight varies by ring size. Gram weights are listed in size 10). Apples of Gold Jewelryn++ is the Original retailer of this Celtic wedding band. Each Celtic wedding band is individually hand-made for the utmost in strength, quality, design, and lifelong endurance. Contact our knowledgeable customer support team today with any questions! 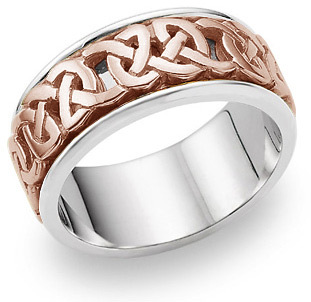 We guarantee our Caedmon 14K Rose Gold Celtic Knot Wedding Band Ring to be high quality, authentic jewelry, as described above.